New incentives are adding to the savings on the already affordable units at Lash Group Of Companies' ME Living Condos. The master-planned community in Scarborough is designed by Turner Fleischer Architects and provides 911 residences spread out through four towers and townhomes. The development is to be built in phases, the first of which will take the form of a 28-storey tower south of the corner of Markham and Ellesmere. A limited time Fall promotion is currently being offered, called the #1 Sales Event, where purchasers can get 1% cash back, a 1% upgrade bonus, $1,000 toward parking, and $1,000 toward a locker, for combined savings of up to $5,000 off of the purchase price. 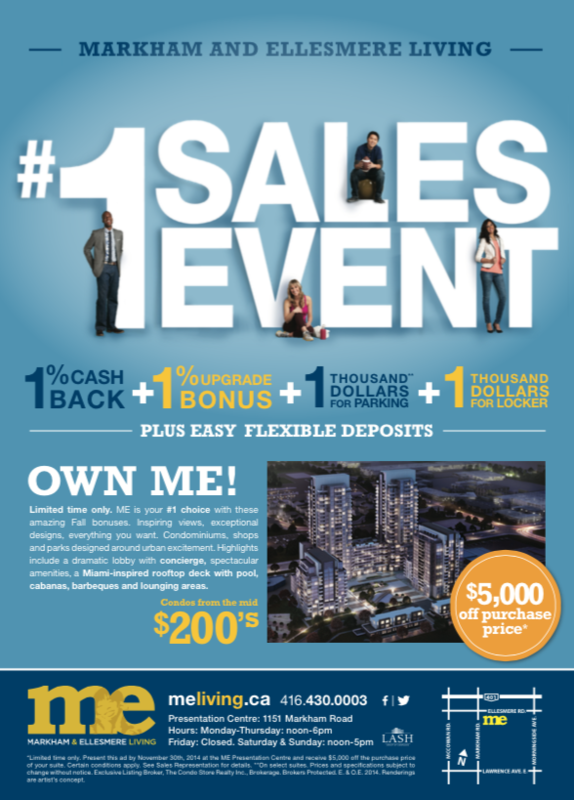 Combined with the starting price in the mid $200,000s and flexibility for deposits, ME Living is providing an affordable entry to the condominium market for many first time buyers and investors. Once construction of the development's first phase is complete, currently slated for 2016, residents of the building will enjoy easy access to both the TTC and Highway 401, as well as several nearby attractions including the Toronto Zoo, Rouge Park and the Scarborough Bluffs. Inside, residents will have access to a selection of amenities including a party room with a demo kitchen and private dining area, a multi-purpose sports lounge and games room, a screening room, a gym, a rooftop terrace with swimming pool, while out front there will be a reflecting pool that transforms into a skating rink during the Winter. To take advantage of the Fall promotion, present this linked page at the ME Living Presentation Centre, located at 1151 Markham Road in Scarborough, between the hours of 12-6 PM Monday to Thursday or 12-5 PM Saturdays and Sundays.